The threat by aviation workers to go on strike to protest the proposed takeover of the country's main airport by Kenya Airways is premature. 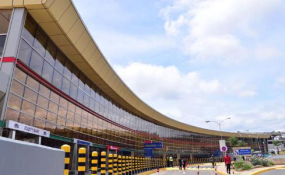 But it brings to the fore the strong undercurrents at play in the plan to hand over the management of the Jomo Kenyatta International Airport to the airline. Clearly, the reason for the deal is to keep the national carrier afloat. Kenya Airports Authority is a profit-making organisation that declares surpluses every year, which is retired to the National Treasury. But KQ is a perennial loss maker. For example, as of last August, it had recorded a Sh4 billion loss for the six preceding months. In 2017, it made a cumulative loss of Sh5.6 billion. Given this context, the proposal is a strategy to cushion it. The KAA should just create a holding company that will manage airports, make profits and use that to subsidise the airline. Such arrangements obtain in many countries. Successful airlines such as the Emirates and Ethiopian Airlines are heavily subsidised by their governments through arrangements where companies are created to manage airports and the carriers -- the former making profits to sustain the latter. Some countries have gone further, outsourcing management of their airports to independent and private entities. For example, Singapore's Changi Airport is managed by an independent consultancy, Changi Airport Group. For six years, it has been ranked the best in the world by global aviation rating agency Skytrax. However, there are fundamental questions that must be addressed regarding the KQ-KAA deal. One, does Kenya Airways have the capacity to manage an airport, given its financial instability? Indications are not clear whether it will fly out of the turbulence soon, and there are reasons for this. First, it made bad strategic decisions regarding the purchase of expensive aeroplanes it did not need and ended up incurring heavy debts it could not repay. Secondly, it expanded to routes that did not make business sense. Even its latest entry into the American market is turning out to be a case of poor economics. In addition, the airline has suffered serious pilferage, especially relating to hedging for fuel costs, operational inefficiencies characterised by flight delays, and a poor pricing model that renders it unattractive. Clearly, there is no compelling reason for KAA to divest from the management of this key airport. Pulling KQ out of the rut is desirable, but it cannot be trusted with the management of the airport, which is a strategic national asset, when it is haemorrhaging and shows no indication of resuscitation and stabilising in the foreseeable future.